I heard from several people yesterday about the issue of whether donor acquisition or donor retention should be the focus for 2013, for those of you who are at least somewhat responsible for fundraising from individuals. Of course, you have to do both, all the time, but just how hard you swing in either direction when you have limited time and resources is an important question. There’s no conflict, as I see it. The fundraising and marketing intelligentsia (everyone who blogs about it and releases studies on it) are talking about retention because that’s what they think is the right reaction to the current state of fundraising. My trends report, on the other hand, asks people what they plan to do in the coming year. This is one of those “turning the ship” problems. Just because “everyone” says we need to pay more attention to retention doesn’t mean that the nonprofit sector is going to hop right to it. The 2013 Trends Report reflects more of the on-the-ground reality. And the reality is that most nonprofits are still in “find me new donors, stat!” mode. I certainly hope we will see retention grow as a priority in coming years and I bet we will see that reflected in future trends reports. To provide a little more data on this question from the report, I am sharing a new chart that doesn’t appear in the report itself, but I’ve added it to the graphics sets on Flickr, Facebook, and Pinterest if you want to share or use it. 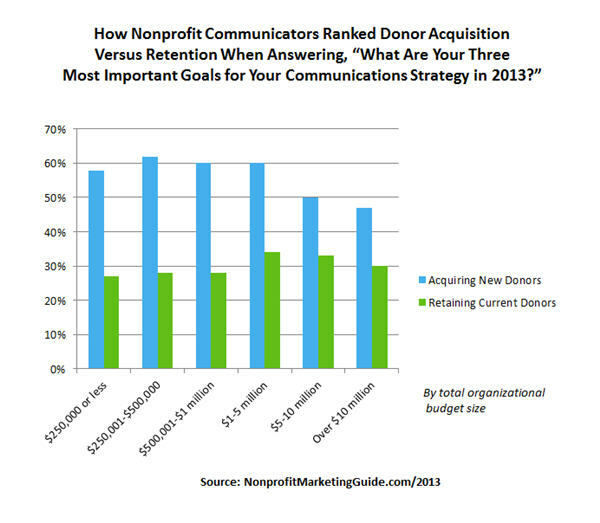 What this tells me is that acquisition beats retention as a goal by 2 to 1 — according to what nonprofits say they plan to do in 2013. What this also tells me is that larger organizations are more likely to balance that out somewhat (the green bars are closer in height to the blue ones). That’s probably because bigger organizations tend to have more development and communications staff who can think more strategically about these questions and larger organizations don’t usually have quite the same fundraising crisis-survival mentality that smaller nonprofits do, which leads to more focus on acquisition.